As Vietnam’s economy has grown, reaching 5.1% in 2012, so have its electricity demands and shortfalls. With rationing now holding down economic development, the government plans for nuclear energy to provide 7.8% of the nation’s power by building 12 reactors with a total capacity of 10,700 MW by 2030. Construction of its first two plants, Ninh Thuan 1 and 2, will begin in 2014. As Vietnam’s economy has grown, reaching 5.1% in 2012, so have its electricity demands and shortfalls. With rationing now holding down economic development, the government plans for nuclear energy to provide 7.8% of the nation’s power by building 12 reactors with a total capacity of 10,700 MW by 2030. The path to that goal will not be easy or short. Possessing only an old research reactor, Vietnam must build the complex infrastructure needed to run reactors from scratch. Nevertheless, Vietnam’s plans are moving along. In 2010 it signed near identical deals with Russia and Japan to build its first two plants in the province of Ninh Thuan, each of which will cost $11 billion. Russia will construct Ninh Thuan 1 at Phouc Dinh and Japan will build Ninh Thuan 2 at Vinh Hai. Plans for another six plants are in the works. The IAEA noted that the government had made significant progress last December, after it held its second Integrated Nuclear Infrastructure Review in the country But the U.N. agency also pointed out that Vietnam’s nuclear program had a great deal more to do. Ninh Thuan 1 will hold two third-generation 1,000-MW VVER reactors. Construction is slated to begin in 2014, with the first unit coming online in 2020 and the second in 2021. Vietnam then plans to build two more 1,000-MW reactors at the site, which are to begin operation in 2023 and 2024. Russia will supply fuel and handle the spent fuel, a standard feature of Rosatom deals. It will lend Vietnam $10 billion to finance the plant. Meanwhile, Japan Atomic Power Co. signed a contract with Electricity of Vietnam (EVN) to conduct a feasibility study for Ninh Thuan 2 on Oct. 6, 2011. A day later EVN signed a cooperative MOU with the Japanese consortium International Nuclear Energy Development of Japan for the design, construction, and operation of the plant. In March JAPC will submit its feasibility report to EVN. Construction at Ninh Thuan 2 will also begin in 2014. Japan will install two third-generation 1,000 MW reactors which will come online in 2021 and 2022. As with its sister project in the region, the Vietnamese planners expect to make Ninh Thuan 2 a four-reactor plant, with Units 3 and 4 to be commissioned in 2026 and 2027. 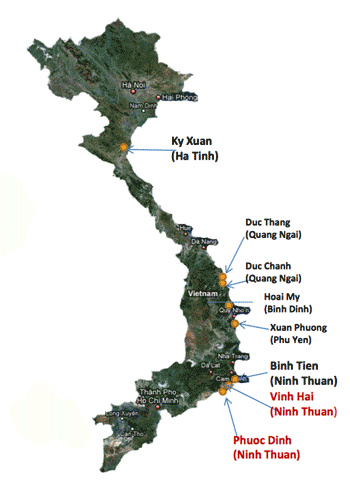 The Vietnamese master plan, issued in 2011, puts another six plants on the agenda: Ha Tinh in Ky Xuan province, Duc Thang and Duc Chanh in Quang Ngai, Hoai My in Binh Dinh, Xuan Phoung in Xun Yen, and Binh Tien in Ninh Thuan. Japan may well construct the Binh Tien plant, as it signed a second agreement to build an unspecified third plant in Ninh Thuan. South Korea is fishing for a deal there as well. In March 2012 it signed an agreement to conduct a one-year feasibility study, to be reviewed by the Vietnamese parliament. If it approves the study, the two countries will proceed to an official agreement. A key stumbling block for Vietnam is its lack of trained nuclear plant operators and technicians. That’s why the government has sent about 400-500 students abroad to study nuclear science and engineering. It is also trying to develop local nuclear education programs as well. Intergovernmental agreements frequently include provision for training local technicians. Russia, a long-time ally of Vietnam, has also supported this training effort. Of the students studying abroad, 200 have gone to Russia alone. Atomstroyexport, a subsidiary of Rosatom, plans to open a Nuclear Science and Technology Center in Hanoi. As part of the Ninh Thuan 2 deal, Japan will train 1,000 workers in Vietnam to operate the plant. The Japan Atomic Energy Agency has conducted nuclear training workshops in the country since 2001, and about 500 Vietnamese nationals have studied under its auspices. In a nation where corruption is endemic, creating a transparent regulatory system is no small feat.